Admiring Silence is a terrific novel: a serendipitous find at my local library. Gurnah is a Tanzanian novelist who now lives in Britain. 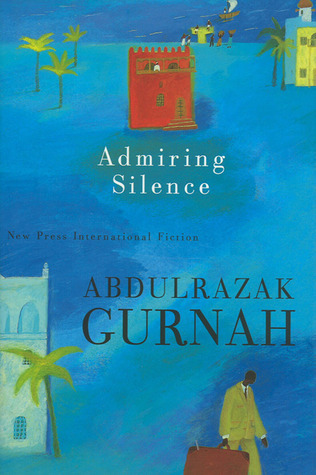 He was shortlisted for the Booker for Paradise (1994) and longlisted for By the Sea in 2001. I really like this author’s style. His unnamed narrator is a refugee from endemic post-colonial political strife in Zanzibar (that large island off the east coast of Africa, it’s a semi-autonomous state of Tanzania). He has a wry, self-deprecating, melancholic tone befitting an outsider who belongs neither in Britain nor in Zanzibar. His discursive manner complicates the narrative because he has a habit of modifying the story of his life to suit the expectations of his listeners…. First we read the story of the narrator’s flight to Britain and how easy it turned out to be to get into university and get a qualification even though it’s not quite the one he wanted. He stumbles upon the love of his life and sets up house with her. He can’t believe his luck; he blithely negotiates the stunned reaction of her parents, and they turn out to be devoted though mildly irritating grandparents despite their doubts about an inter-racial relationship. He and the lovely Emma express her pseudo-anarchic tendencies by not actually getting married but they otherwise seem to live an ordinary life, he teaching and not disliking it enough to change, and she achieving a brilliant first at university and going on to lecture in narrative theory. … I did not have the heart to tell him that I was not Afro-Caribbean, or any kind of Caribbean, or even anything to do with the Atlantic – strictly an Indian Ocean lad, Muslim, orthodox Sunni by upbringing, Wahhabi by association and still unable to escape the consequences of those early constructions. I swallowed all those incurable diseases with a stoical gulp and an inward sneer at his ignorance. He didn’t mention Aids, for instance, which has its headquarters in our part of the world, probably because we seem unable to restrain ourselves from having relations with monkeys. I suppose I could have put him right, but just then I felt like showing solidarity with my brethren. They couldn’t help their afflictions, so why mock? Anyway, if I had told him, he might have lost confidence in his diagnosis, and might have started his kneading and pounding all over again, and asked for blood tests and mercury cures or whatever they do nowadays to test out their theories on degenerating races. I did not think I could bear that. My body felt bruised and feverish enough already. He didn’t mean Afro-Caribbean people anyway. He meant darkies, hubshis, abids, bongo-bongos, say-it-loud-I’m-black-and-I’m-proud victims of starvation and tyranny and disease and unregulated lusts and history etc. You know, my race. I could see he approved of my respectful silence, because he smilingly issued his prohibitions and instructions, wagging his finger now and then to warn me off naughty temptations. Ok, then things change in Zanzibar, and it’s safe enough to visit his family. And this is where the reader makes some very interesting discoveries about the narrative we’ve just read. We have been led up the garden path, as my mother says about people peddling disinformation for their own purposes. The stories that the narrator has been telling about his background have not just been a genial way of getting along with his father-in-law or pandering to Emma’s scorn for colonialism, they suggest that the narrator is dislocated not just in place but in reality. Not even the composition of his Zanzibar family is coherent. Add to that the narrator’s consternation about the state of affairs in Zanzibar: the corruption, the muddle, the dirt and decay and the poverty and hopelessness, and we see his inability to reconcile Britain’s imperial responsibility for colonialism with Africa’s self-inflicted post-colonial chaos. He can’t accommodate his guilt about wanting his comfortable life in England with his shame about the life that his family leads. His psychological distress is masked by black humour which reinforces the narrative cunning which underlies this novel. I wished that I was back in Battersea with Emma, back home. It wasn’t England that was home (so you can roll back the red carpet, or file away, if you care, reproaches against the alienated native) but the life I had known with Emma. It was the secretest, most complete, most real part of me. And then the unexpected conclusion. Ok, maybe other readers won’t be as surprised as I was, but I had grown to like this narrator and wanted things to somehow resolve for him. He is enmeshed in the expectations of societies which compete for his acquiescence and his way of managing these has been to suppress them, to play along with the expectations of others rather than confront them. He has believed (as you can see from the excerpt about the doctor above) that even a mild clarification is pointless, but what he has failed to recognise is the impact on his own identity. While Zanzibar was dangerous for people like him, his exile made it possible for him to deny kinship ties. He could justify suppressing aspects of his English life in letters home because it would shame his family: his illiterate mother would not understand and would be embarrassed at having his revelations read aloud to her by a paid reader. But when in the brief moment of political sunshine in Zanzibar Emma pressures him to visit his family, the stage is set for a clash between his love for her and the demands of kinship. The narrator seems philosophical about the way things turn out but I’m bothered about him. He has, after all he has been through, no home. I am also fascinated by how the author has wrought this response from me, and puzzled about why there is no comparable Australian novel. Surely there should be? I’m interested to hear you liked this author so much Lisa. Quite some years ago I was very impressed and moved by his novel – ‘By The Sea’. And then later by ‘The Last Gift’ which was Booker shortlisted. Now I shall seek out ‘Admiring Silence’. Hi Robin, if you can’t get it from your local library, try Brotherhood Books, I’ve just ordered By the Sea, Desertion and Dottie, and got the lot for just over $15.00. Just be aware that their search function isn’t great, it’s nearly always better to search by author. (By the Sea was a no result search, but I found it when I searched by name). Sometimes you can find out-of-print books second-hand at Fishpond too. This sounds fascinating will look it up. I used to live in East Africa and never tire of reading post-colonial writing about displacement. Yes, I find it interesting – well, more than interesting, maybe essential – because I live in an immigrant society which has been through phases of receiving refugees who are noticeably different in appearance. For the first generations ever to come here from Vietnam, Cambodia, China (Tiananman Square), the Horn of Africa and so on, they carried their newness with them everywhere. They stood out because they looked so different, and some were subjected to overt racism as well as the casual thoughtless kind. We were ignorant about them, and they were ignorant about us. There were language barriers and not enough translators. Hurt feelings on both sides sometimes when clumsy attempts to build a bridge went awry. So a book like this that brings a reader ‘inside’ the experience is very valuable. When it is so cleverly written that the experience of reading it is a wonder, that’s a bonus!